The organ was saved by Joseph Cullen (organist and choral conductor), and kept with the intention of being restored as a practice organ. It is ideal for this purpose, as it has two manuals and pedal, with full compasses, all in the case of a large chamber organ. 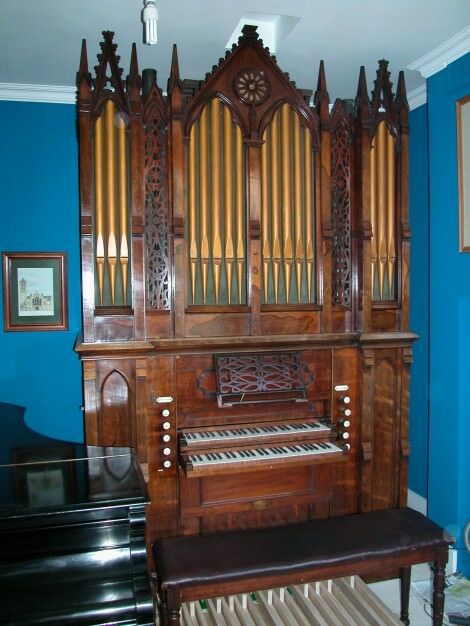 The organ was restored by Christina Reinspach and Dominic Gwynn in the summer of 2003. The manual key compass is C – f³ (56 notes). The Swell organ is inside the swell box from cº. The pedal key compass was originally C – c¹ (25 notes). The pedal keys, and the rest of the key action was missing, and were replaced with new keys and action on the original design but with a C – d¹ compass and modern key spacing.